(Godey’s Lady’s Book, March 1896 ) If the art of fencing ever becomes general in America as an addition to the various muscle-producing pasties, its champion may properly be found, mirabile dictu, in a woman. From the far Southwest, the odor of the raven-flower still clinging to her brown tresses, comes Jaquarina, a true type of Spanish-American beauty. To be accurate, she is the champion mounted broadsword fencer of America, and the champion woman fencer of the world; distinctions which she has gained after contests with trained soldiers, men who have fought Apaches, Zulus, and Boers. She has been selected by some wealthy Californians as the sole representative of the sword for America in the Olympic games at Athens, Greece, this spring. 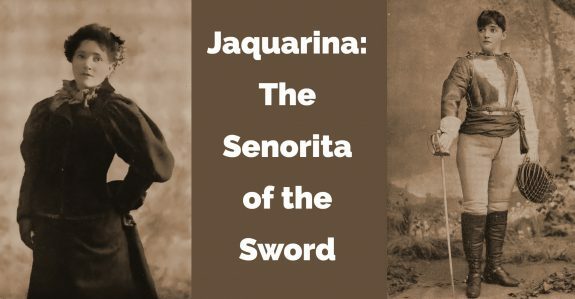 Most of Jaquarina’s life* has been spent on the family ranch in Ensenada, sixty-five miles from Coronado Beach, in Lower California, where she is known as “The Spanish woman Soldier;” for her chief delight has been to ride with the cavalry in their sham battles. At an early age she showed a frail constitution, and her mother—a native of Madrid, who, like most well-trained Spanish women, was adept with the foil—taught her to fence. The exercise restored her to health, and so interested had she become the pastime that she was put in training at a private military academy. As a horsewoman, Jaquarina rides both side and astride with equal skill, and she demonstrates that a woman is not helpless in her skirts, by picking up objects from the ground while her horse is running at full speed, for she does all the equestrian tricks for which the Comanche Indians and the Mexican vaqueros are famous. Of her two horses, Salem has been trained for mounted combat. He obeys signals, given by pressure of the knee, to walk sideways in crowding an opponent, to pirouette, to charge forward, or retreat rapidly. A trifling misdemeanor, resulting from his zeal, is that, unless watched at the signal of “desist,” he will turn upon his adversary’s horse and strike with both hind feet. The other horse, Muchacho (which is Spanish for “little boy”), a highly bred Mexican and Arabian, is used only for pleasure riding. Jaquarina’s record shows that she has never been defeated in any contest, mounted or on foot. Her foot bouts with foil or rapier are too numerous to mention. Her greatest achievements—and very remarkable they are for a woman—have been her mounted broad-sword contests, for which the smallest amount of any purse she has won was $500. She first defeated Captain J.H. Marshall, ex-officer Sixth Dragoon Guards, English Army, who had served in Zululand and the Boer war. The contest took place in Woodward’s Garden, SanFrancisco, July 4, 1886. There were twenty-one attacks, score 10 to 11. She again defeated Captain Marshall, score12 to 9, at San José. The woman knocked the soldier from his horse by a blow from her saber. 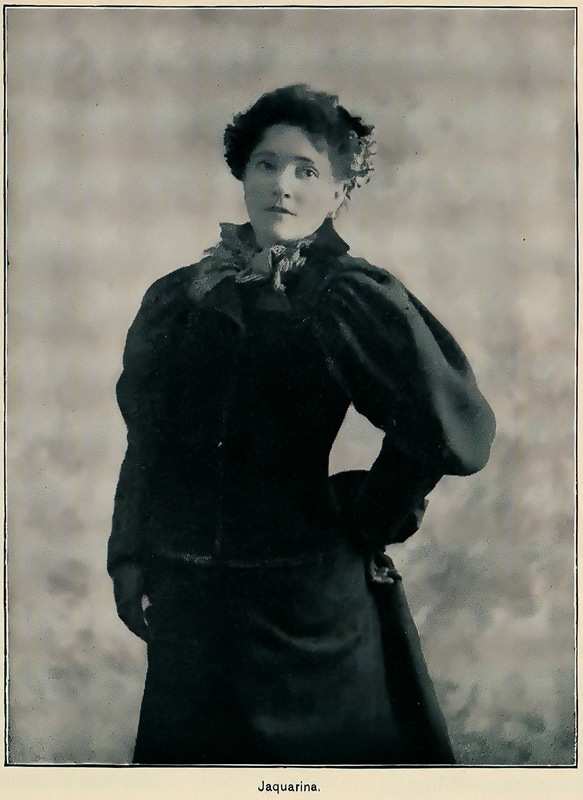 In San Francisco, in April 1886, Jaquarina challenged Duncan C. Ross, who refused to meet her, on the grounds that he would not contest with a woman. Francisco, from the Apache war, where he had fought under GeneralMiles. 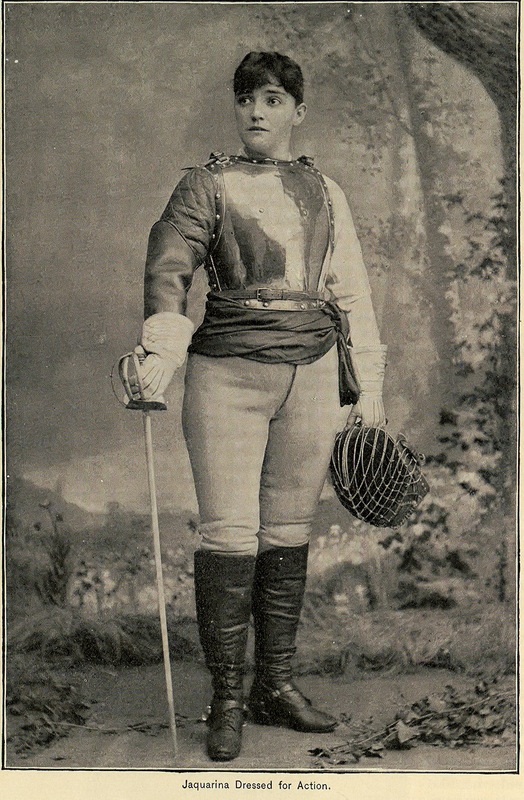 Jaquarina having declared herself ready to accept the challenge of any fencer in any part of the world—a most remarkable defiance for a young woman of twenty-two—Sergeant Davis took up the gauntlet, and a contest came off at Mechanics’ Pavilion, San Francisco, February 8, 1887, resulting in the defeat of the army’s boasted champion. The score was 11 to 7, certainly a glorious record for a woman in her third mounted contest. The newspaper reports the time, and a document signed by all the officials, the judges, seconds, and time-keepers, testify that Jaquarina was not favored in any way, that she squarely won her victory over the hardened soldier. Jaquarina scored 15 points, the reports show, but was of three points on the decision of the judge, Captain Marshall, whom she had previously twice defeated. The Captain claimed that he was unable to make any decision in these attacks, and they were thrown out of the record on the plea of “time-cuts,” or that both contestants made points simultaneously. By the accidental “shearing the ears” of Davis’s horse, Jaquarina under the rules was deprived of another point. Davis had never been defeated before. He had engaged in twenty-one duels of this character. It is said that the penalty of the defeat of the cavalryman by a woman with a weapon was that he was forbidden ever again to engage in combat while at the Presidio. Within twenty-four hours after Jaquarina’s defeat of Sergeant Davis, she was challenged by Captain Jennings, master-at-arms of the Olympic Athletic Club, San Francisco, and an ex-officer of the British Army, who, smarting over his defeat by Jaquarina in a foot bout before the club, was determined to defeat her on a horse. The match took place fourteen days after the Davis encounter. At the finish of the twenty-first attack the score stood 8 to 8. It was agreed to decide the contest by the result of one attack on foot. Jaquarina won the battle in twenty seconds. Still, Captain Jennings was not satisfied, although already defeated three times in succession by his fair opponent, and he again challenged her to combat, eleven attacks on foot, eleven mounted. Jaquarina won on foot, 6 to 4; mounted, 6 to 5; score, 12 to 9. Her next victory was over Captain Weidermann, ex-officer of the German Cavalry, a pupil of the famous Colonel Ivan Wicowsky, of the Russian Imperial Guard. Then an ex-lieutenant of the Austrian Cavalry, Baron Arno von Freilitzsch, was vanquished by the undaunted Jaquarina at Los Angeles, May 26, 1889; score, 8 to 3. This was her last contest for a purse, although she has repeatedly declared herself willing a match. In an open letter published in the Chicago Inter-Ocean, July last, she claimed the broadsword championship of America, and the woman’s sword championship of the world, and declared herself willing to meet any fencer in the world for a purse of from$1,000 to $5,000 a side. Never having been defeated in any contest, and never having refused the challenge of any recognized master-at-arms, by the laws of the sporting world she is entitled to her claims as champion. Her severest battle was with Captain Weidermann, although Sergeant Davis pressed her closely for skill. The Captain’s sword crushed through the face of her mask, cutting her nose, the scar of which still shows. He was a powerful athlete, weighing 195 pounds. His chest measure was 43 inches and the biceps of his sword arm 15 inches. After the contest, he stated that Jaquarina was the quickest and most powerful fencer had ever met. Dressed for action, Jaquarina wears a polished steel cuirass which weighs thirty-seven pounds. A lot of practice is necessary to wear this great load on horseback and keep the balance. In training, she has a system peculiarly her own. For two months previous to an any important contest she rises at four o’clock in the morning and rides astride until eight o’clock, keeping her horse at a sharp trot all the time. At eight o’clock she eats the regulation frugal breakfast, after having taken a bath and been thoroughly rubbed by two colored women who have been her attendants for several years. After a rest, she goes out for a two hours’ run with her two great hounds as pace-makers, choosing hilly country, where she can climb rocks and run up and down hills to strengthen her wind. At two o’clock she eats the regulation dinner, and after a rest of two or three hours goes through an exercise to strengthen arms, shoulders, chest, and back. She depends for this wholly upon calisthenic exercises, consisting of the simple contraction and relaxation of muscular movements, as she does not advocate the use of dumb-bells, pulling apparatus, or weights of any kind. Such appliances, she claims, have a tendency to bunch the muscles, which is a very undesirable thing in the perfect female figure. To substantiate her theory, Jaquarina presents a physique of iron, without an ounce of superfluous flesh. Her arm, although firm as marble, has not lost a particle of grace, the muscular development being so evenly distributed. To strengthen her sword arm, she uses the heavy sword employed in all her contests, going through the cut and parry movements with lightning-like rapidity. In all her training she never fences with anyone, and this is probably the reason why she is so rapid in her cuts that she baffles the skill of her opponents; for fencing with a trainer would have a tendency to make her movements slower than those she acquires by thrusting and cutting at an imaginary sword in the air. Although Jaquarina weighs 190 pounds, she does not look as if she weighed over one hundred and fifty pounds. It is only when she appears in fencing costume that her wonderful physical development becomes apparent. She knows how to modulate the tones of her voice when she relates her exploits, always modestly and frankly, seeming apologetic at times that as a woman she should be able to equal her male opponents in strength and agility. She is one of the few women I have ever met who have perfect “corset figures.”It is hard to believe, but it is true, that she uses no stays at all. This, she says, is due to a simple contraction exercise of the abdominal muscles. At times her large brown eyes fairly snap, revealing her Spanish origin. She is an enthusiast on the value of fencing for adding to the grace and strength of the body. There is no exercise so good, she contends, for bringing into simultaneous action all the muscles of the body. Besides, the agility which it develops is of incalculable benefit to the eye and the brain. Jaquarina has her eye so trained that she can look you in the face and at the same time read the top headlines of a newspaper on the floor.